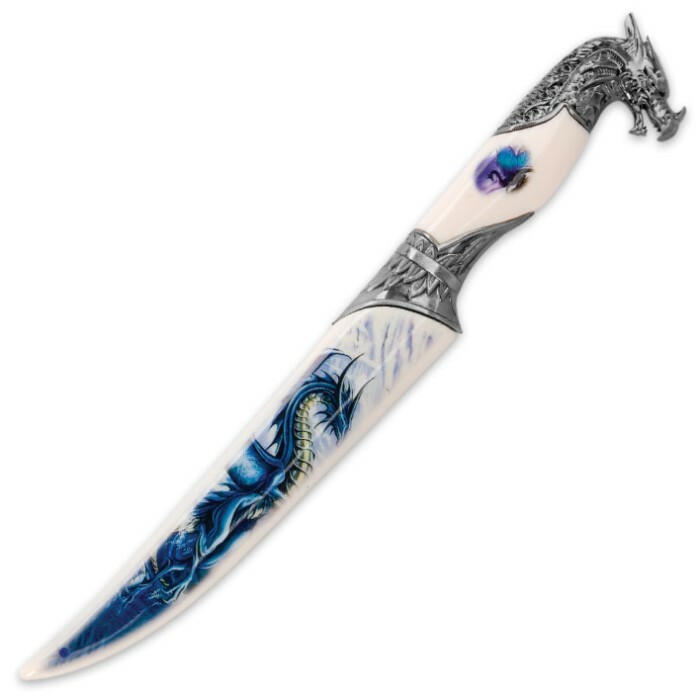 Laden with vivid, colorful art and an exquisitely detailed metal dragon sculpture and accents, the Radiant Blue Dragon Fantasy Bowie Knife and its companion sheath is absolutely stunning! 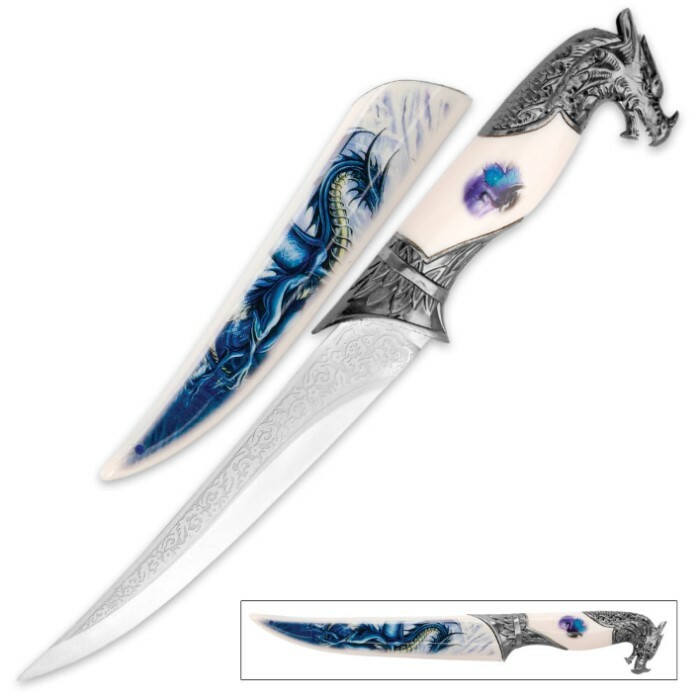 No fantasy blade collection is truly complete without this gracefully forged masterpiece. The sleek 8” false-edged stainless steel blade gleams and dazzles, accented with an elegant floral relief design along the spine. The brilliantly polished white sheath and handle evoke vintage ivory. A radiant blue dragon taking flight, his razor-sharp talons outstretched and menacing horns curving skyward from a richly detailed head, is portrayed on the sheath. 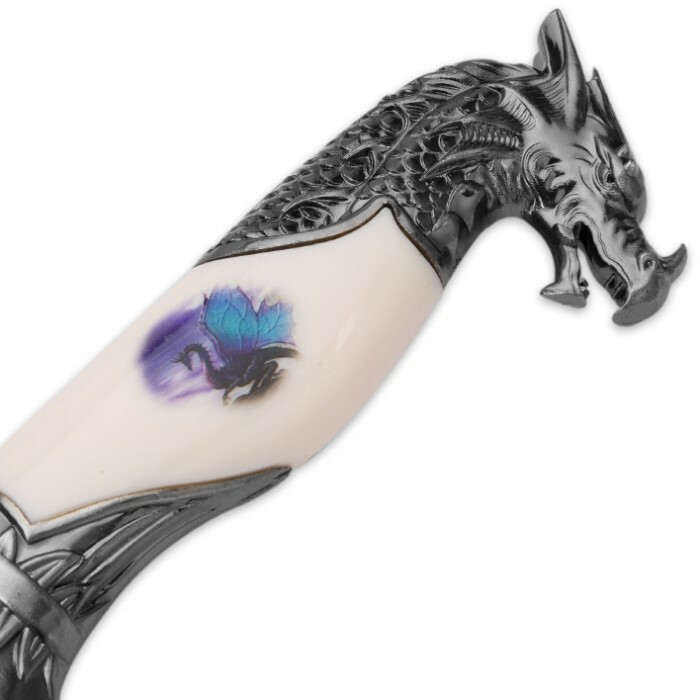 A similar scene is meticulously painted in miniature on the handle, offset on both sides with antique silver-colored casting of a dragon – intricate scales, fins, feathers and other features showcased handsomely. A lone deep-blue jewel is inlaid at the scabbard tip. The set is a great prop for theater, cosplay, screenplays or fantasy conventions. It also makes a lovely gift for high fantasy fans, dragon enthusiasts, exotic blade collectors and cosplay devotees. This knife is pretty good. Glad I bought it for display.